Use Desitin Daily Defense Diaper Rash Cream every day to soothe, treat and prevent diaper rash. This hypoallergenic and Pediatrician-tested formula instantly forms a protective barrier on your baby's tender skin and is clinically shown to provide diaper rash relief. It is designed to work at the first hint of diaper rash to help heal and soothe your baby's skin. Made with fast-acting zinc oxide formula, this diaper cream helps seal out wetness and provides protection from the first use. It is dermatologist-tested and free of parabens, phthalates, and dyes, so it's gentle enough to use at every diaper change. The creamy formula goes on smoothly and wipes off easily, making Desitin Daily Defense Diaper Rash Cream your trusted partner for treating diaper rash from the first signs. Stop Use Indications: For external use only.When using this product:Do not get into eyes.Stop use and ask a doctor if:Condition worsens.Symptoms last more than 7 days or clear up and occur again within a few days.Keep out of reach of children,. If swallowed, get medical help or contact a Poison Control Center right away. Warnings: For external use only. When using this product: do not get into eyes. Stop use and ask a doctor if: condition worsens; symptoms last more than 7 days or clear up and occur again within a few days. Keep out of reach of children. If swallowed, get medical help or contact a Poison Control Center right away. Dosage: Change wet and soiled diapers promptly Cleanse the diaper area Allow to dry Apply cream liberally as often as necessary, with each diaper change, especially at bedtime or anytime when exposure to wet diapers may be prolonged. Instructions: Directions: Change wet and soiled diapers promptly. Cleanse the diaper area. Allow to dry. Apply cream liberally as often as necessary, with each diaper change, especially at bedtime or anytime when exposure to wet diapers may be prolonged. After 12 hours use it was effective in clearing up my 5 week old sons diaper rash. Just be sure to rinse the area with wArm water, dry completely and then apply to the affected area as it basically seals in any moisture or residual feces against the skin, so be sure it's clean before use! 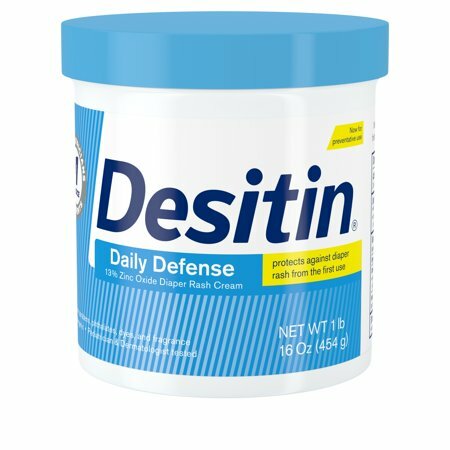 I use Desitin on my child at every diaper change to prevent and treat diaper rash. It's much cheaper for this 2 pack through Sam's Club than buying one tube at a time at the store. Since these tubes are bigger, it's almost like a buy one get one free deal. I got free shipping and stocked up since my local store does not sell Desitin. I would purchase this again. Necessity For all mom's ! I love this thing, My daughter started getting a beginning minor diaper rash, and as soon as i applied this cream the redness got lighter and lighter with every diaper change and the next morning it was already gone. Thankfully She didn't have to suffer with having it really bad. After that I use it every single time and it completely prevents it from coming back. I bought 3 of these ! One jar for the house and the 2 tubes for on-the-go in the diaper bag. I Love it :) every mommy must have Desitin. Please bring this back! This stuff is amazing and works so well my baby. I have not found anything to work better and this includes other Desitin products. I really love this ointment. I actually use it on my daughters face on colder days - fall/winter. I apply it at night and it's the only thing that helps her seasonal eczema and dryness. She wakes up with soft and beautiful skin. I can't find any place that sells this product. Is it discontinued? I really hope not. I'm desperately searching for another tube. Very good value. The container is so full of the product, I have been using it for two weeks from the cover alone. I love desitin. This is an Amazing cream that protects my daughter. It's not too oily or sticky like the other desitins. I can't find this one in the store and I'm very upset about that. I love this formula, i know the other are ok, but this formula was great. it would get ride of the diaper rash in two days, your other dont. it was great for my daugther ezcema as well even with winter dry out. We appreciate your feedback! We'd like to hear more from you. Please give us a call at 866-565-2229. We're available Monday through Friday, 9am to 5:30pm ET. We look forward to your call! The ointments, creams and pastes are all decent. But I miss the Desitin baby powder. I always used that on my kids and it worked great. I don't understand why they would discontinue a great product like that. I wish it was still around so I could use it on my grandkids. I prefer the powder over any cream or ointment for diaper rashes. Great product and only product that doesn't cause a skin reaction on child's skin. Unfortunately product is not sold in stores near me, hardly advailable on website to purchase, and it's to expensive to purchase on the great Amazon website. Our only way of getting it is to have family buy it in other states and mail it.